The Wood Creations Espresso Finish Toy Box doesn't necessarily need to be filled with toys. We think it would be kind of groovy to use it as a coffee table. Get it? If you do choose to fill the ample interior with blankets or toys, the items will be well-protected by the handcrafted birch frame, birch veneer paneling, and optional cedar base. Fingers large and small will be protected by the safety-hinged lid that prevents slamming. A satin clear topcoat covers the dark espresso finish, so this chest will remain a gorgeous piece of furniture for years to come. Which is a good thing, as Martha would say. Because you'll never want to move this chest out of your home. The Wood Creations Espresso Finish Toy Box comes ready to assemble. Solid birch frame with birch veneer paneling. Espresso finish with satin topcoat. Optional cedar base to protect your treasures. Safety hinge prevents lid from slamming. Meets all CPSC product safety standards. Assembly required. 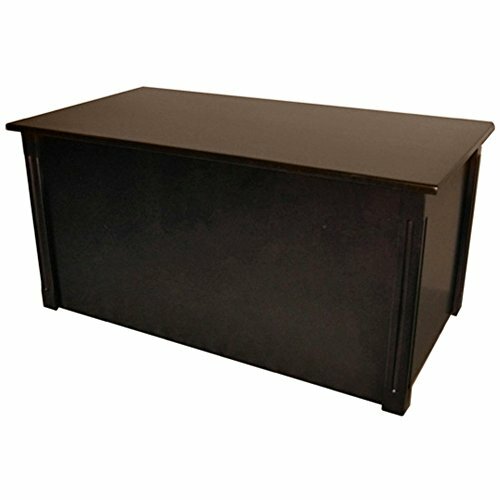 Measures 21L x 40W x 20H inches.